Lynden’s grounds include several natural areas we manage as prairies. 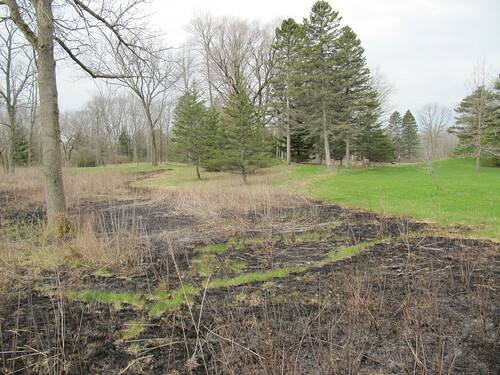 This means that within these habitats that range in size from 1-3 acres, we are trying to grow the native flowering plants and grasses that were once common in this part of Wisconsin before logging and farming transformed our landscape in the 1800’s. Once you get them growing, native plants require remarkably little care because, after living here for thousands of years, they are well adapted to our local soil and climate conditions. But getting them growing takes some work because existing “weedy” plants like Canada Thistle, Kentucky Bluegrass, European Buckthorn and Honeysuckle, don’t willingly vacate their space to newcomers, even when the new plants claim original title to the landscape. To discourage weeds and encourage native plants we use methods like manual weeding, mechanical mowing, and the judicious application of herbicides. 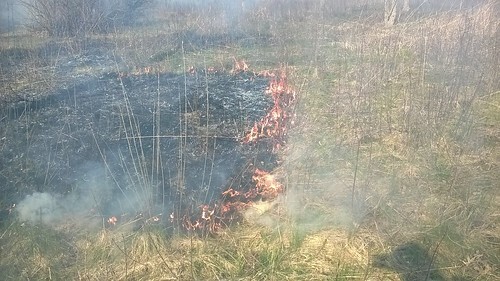 In late April we tried another tool, a controlled fire, to achieve this same goal. Under the supervision and guidance of an experienced contractor we burned portions of our Northwest and Southeast prairies. Conditions for the fire were nearly perfect, including light but steady winds around 10 miles per hour, low relative humidity, and sunny skies. The fire moved slowly, converting years of accumulated plant litter into nutritious ash. 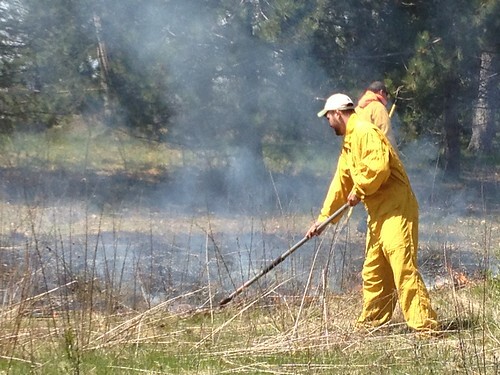 After 6 hours we burned 3 acres and were happy with the results. 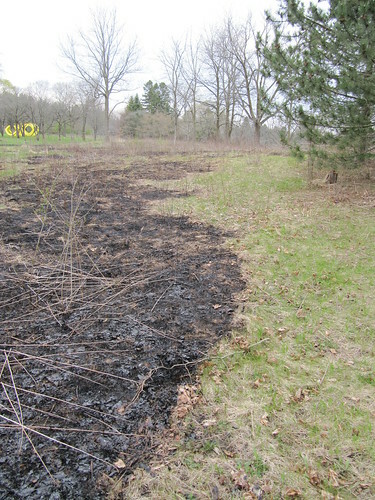 By exposing large patches of soil and covering them with sunlight absorbing black cinders, the burn helps the ground warm up more quickly. This in turn will help desirable “warm-season” prairie plants get a head start over less desirable “cool-season” weeds. One cool-season weed we especially hope to set back is Kentucky blue grass or KGB. Although desirable in our formal lawns, KGB is much too abundant in our prairies where it outcompetes native species for food and sunlight. Judging by the fire’s immediate aftermath, we successfully burned away a significant amount of newly greening KGB. Unfortunately, just burning away its leaves won’t kill it. The roots likely survived the fire and we suspect they contain enough food reserves to fuel new grass shoots. But hopefully, in the window of time it takes the KGB to recover, new prairie plants will gain a foothold. Over the 2016 growing season we’ll keep a close eye on the burn areas and provide updates on how the land recovers.